ALTHOUGH HIS TARGETS and "Chevrons" proclaimed Noland to be an artist of the first rank, if anything the "Stripes" of 1967-70 constituted a grand and classical culmination of his development. Superficially the most passive of Noland's formats, this magnificent series abounds in masterpieces. Unlike many of his contemporaries, Noland didn't use strictly parallel bands of color until he'd found formats to enliven them. Parallel bands were common in '60s painting, but painters usually used them in vertical configurations. Horizontal, bands threatened to evoke landscape, breaking the picture apart at a series of "horizons." Upright bands seemed more likely to stand side by side on the picture surface like pickets in a fence. Noland wanted to avoid the effect of a fence. For him the upright configuration concealed a problem deeper than the threat of suggesting landscape. Upright bands and stripes on the picture surface tended to appear as sculptural shapes (pickets, indeed!) applied before or upon a background. By this time Noland was committed to merging figure and ground into an ambiguous, emblematic presence. To accomplish this, he chose horizontal alignment. 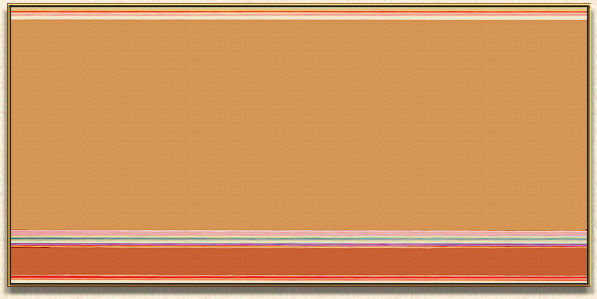 Noland's "Stripe" formats were as brilliant as they were simple. By extending shape laterally, horizontal bands took advantage of the tendency of eyes to scan from side to side, and took corresponding advantage of the available width of walls in relation to more confined height. In offering an uninterrupted horizontal surface to eyesight, the horizontal bands reinforced color continuity and repressed shape and solidity. The optical replaced the sculptural. The suggestion of landscape wasn't overcome so much as it was raised to a common area of perception. The "Stripes" don't really resemble landscape, yet one responds to them as one might to an extensive view. The "Stripes" are typically much wider than they are tall, often in the proportion of 10:1 or more. The "stripes" which composed them ranged from narrow bars or lines to wide bands or panels. Any number of bands could be stacked, and picture width could vary as well. Many "Stripe" paintings were no more than a few inches tall and five or six feet wide; others were colored giants eight or nine feet high and fifteen or more feet wide. The ends or sides of the horizontal paintings as well as the tops and bottoms are in accord with the length and width of the total bunch of colors in a successful picture. The ends don't chop off the bands; the bands don't extend beyond the ends. The threshold between the depicted symmetry and the actual symmetry of the object makes room for illusion and expression. This is true for all painting -- between the subject of nature painting (still life, landscape, portrait, etc.) and the picture shape. After all, subject matter never is the ultimate content of a work of art. The artistic content overrides. Cézanne is the supreme master of this. These paintings didn't tell stories. In Bernard Berenson's terms, they didn't illustrate. They pushed farther from illustration than any previous paintings, yet they remained pictures, some of the most magnificent and original pictures of the last century.